I love the WeeStamps range and have lot of their digital stamps. This one is called Rosetta. I coloured her with Copic pens and added some glitter to her wings. I die cut the image using one of the Spellbinders dies. 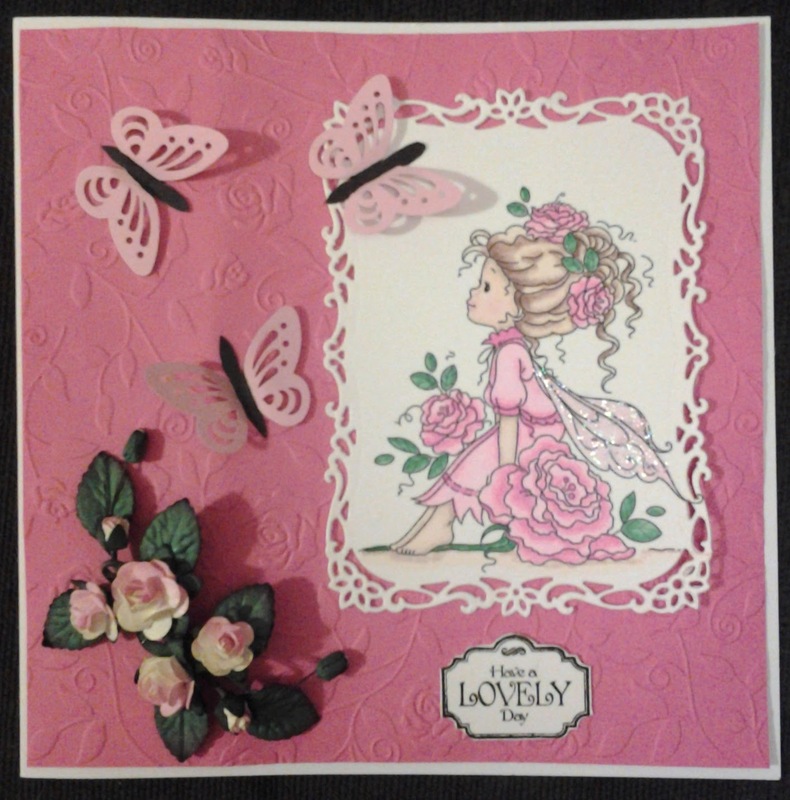 I layered some pink embossed card onto a white card blank and glued the coloured image onto it. I added some punched butterflies, I coloured the bodies with a black copic pen.. A stamped sentiment and some paper roses finish the card. How beautifully colored she is, Sue! I love that this card is a reminder to sit down, enjoy beauty, and breathe in the goodness that is all around us. It's a lovely card! Thank-you for joining us at the Crafts Galore Encore Challenge "Anything Craft Goes". I hope you have enjoyed playing along as much as we have enjoyed seeing your talent. Please check back to see if you are a winner! Thank-you for joining us at the Crafts Galore Encore Challenge September ATG.